Davison G235 Jet Black offers you the means to jam at home at an astoundingly low price. 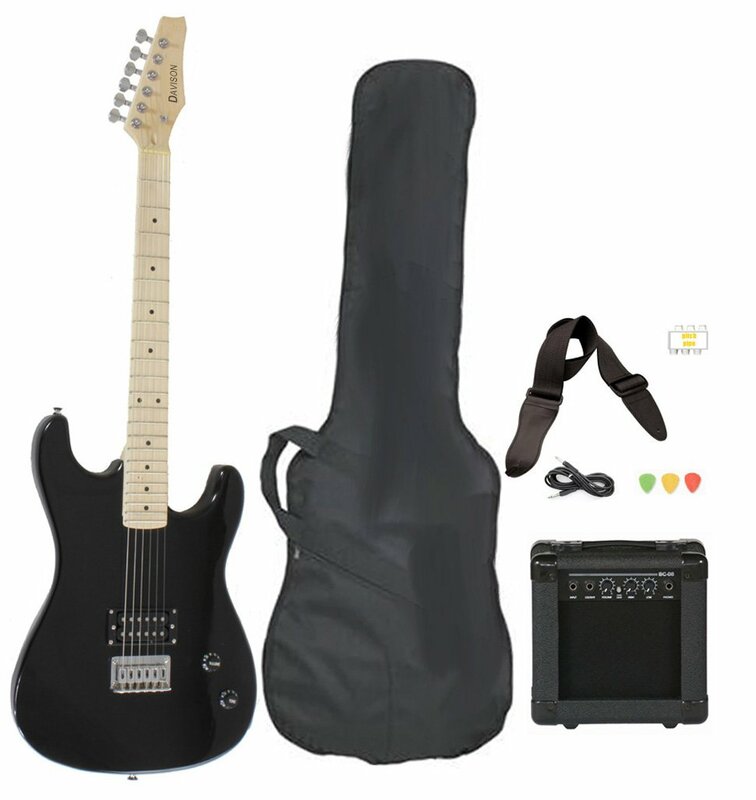 Just around $100 you will have a 39” G235 Jet Black electric guitar, a Hollinger BC-08 portable amp, a bag case and Accessories bundle. This is a G235 Jet Black Davison electric guitar review. 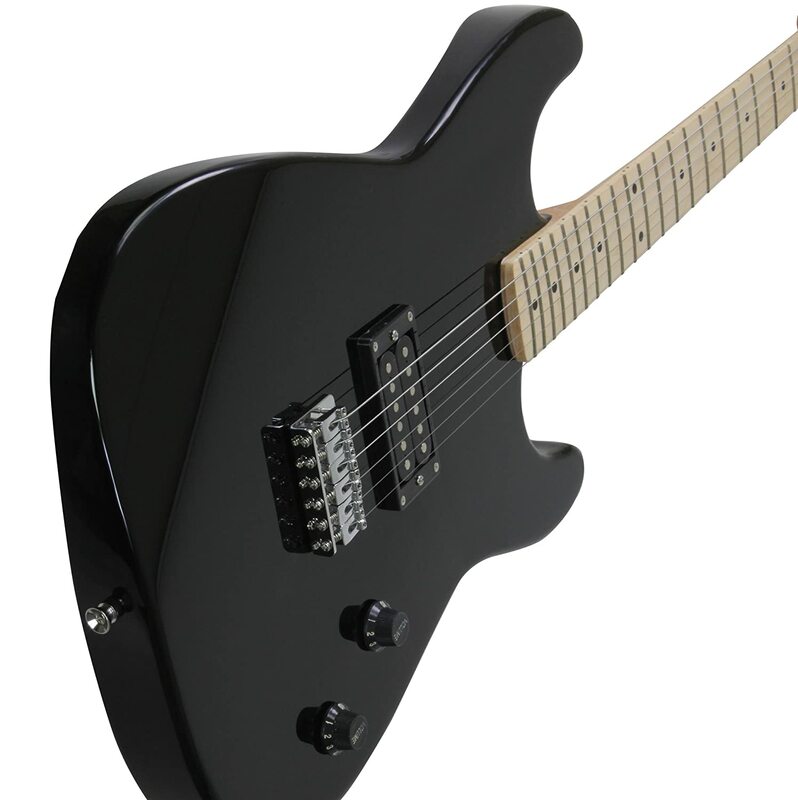 The standard black Davison guitar for starters comes with a basswood body. Commonly used on budget and medium-level guitars, it is a rather nice tonewood which gives satisfying tonality. Powerful midrange is what this guitar boasts, without losing its ability to pull off slick highs and satisfying lows. Carefully engineered, it has decent dynamics and is perfect for any novice in musicianship. A rather warm tone is a product of its contoured body, but the player should be careful with this guitar, for it’s not very durable. Basswood is naturally light, and even though it might not break if attention is not given, the sound may deteriorate and become dull. Hard and heavy, maple was used to make the neck of this guitar a powerful one. It complements the majestic middles with clear-cut lows. The solid body of this guitar gives off an explicitly warm, sonorous and thrilling sound. Including rosewood fretboard on a maple neck, the overall tonality of the Jet develops a brighter color, giving more edge to highs and greater density of the lows. While already being solid, the middles bear more responsiveness. Plainly said, the rosewood fretboard can be a real addition to the overall sound of the Jet Black. The G235 Jet black is outfitted with chrome bridge, more precisely, with “triple chrome plating”. The bridge is primarily plated with copper, secondly, with nickel, and lastly, with chrome. Leveling and polishing come much simpler with copper and nickel are terrific for greater chrome adherence. Chromium is implemented on a lot of guitars nowadays, mainly because it boasts the potential to look as good as new for great periods of time. Other positive attributes the chrome plating possesses are not to be overlooked: it is reliable and tenacious, its rather hardly damaged and is highly resistant to corrosion. A standard headstock crowns the Jet Black with adjustable die-cast tuners, otherwise known as the “machine” tuners. Individual parts composed of molten metal, installed into a machined die, somewhat cooled sooner than being expelled out of the molding system. When fully cooled, individual parts are administered to particular construction. Supplied with a double coil pickup, otherwise known as a “humbucker”, the Jet Black is capable of dishing out some serious noise. Aligned in parallel, the stock humbuckers are ideal for starting musicians, and can be easily swapped for more expensive ones should you want to customize your own sound after learning the basics. If the player should happen to play without humbuckers, a hum could be heard surrounding the pickups while the quiet sections are performed. Humbuckers drastically lower the humming in comparison to unprotected single coils. 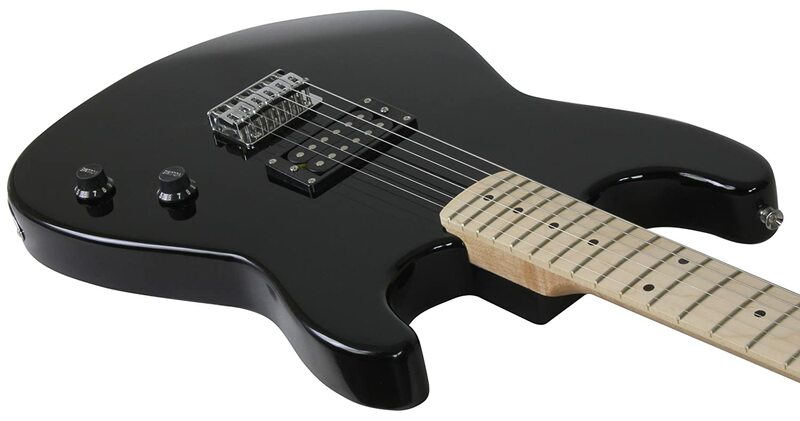 The Jet Black is composed of basswood body, rosewood fretboard, and maple neck and outfitted with humbucker pickups, each part contributing and defining the complete sound of this model. While the basswood from the body gives outstanding middles and quite decent lows, the rosewood fretboard spruces up the highs. Considering this starter pack, the default sound you will get (if you do not happen to have another amp) is from the Hollinger 10 BC-08 amp. For such a small amp it is quite strong. Later customization of your own sound can be obtained by either purchasing another amp or pedals to string up to Hollinger. Few things should be taken into consideration before reviewing the ratings for this guitar. The proportion of price and quality, guitars overall performance and the satisfaction of the buyers, as well as miscellaneous items that come as a bonus. Considering the price, it is as low as it gets. Most of the customers have awarded a maximum number of review points precisely because of this. Although low costs more often than not indicate suspicious quality, this is not the case. Low cost of the Jet Black was intended to attract new people to the splendid art of musicianship by making it available to every budget. Over the internet, the ratings vary, but not substantially. Out of possible 5 stars, G235 Jet Black gets an average of 4. People tend to like it for its availability and low cost, but point out that it’s not a guitar you would want to play your entire life. One of the biggest compliments concerning the Jet Black is that it’s one of the best starter guitars there is. Easy and fun to play, the G235 Jet Black offers decent quality for the ridiculously low price. It comes with a 10 amp Hollinger BC-08, a gig bag and a bundle of accessories. You can’t make a mistake by buying it because it provides both the means to master the basics and fun. It’s majestic and it’s yours.